I have to be blunt. I am finding it increasingly difficult to find the motivation and enthusiasm to write about Super Rugby. No, it is not about a team I might support doing badly. I am not a fair-weather friend that only supports my team if they are winning. I am with them all the way, win or lose. Sadly, my disenchantment with the game is about the game of rugby itself. The “product” – as Sanzaar’s head suit Andy Marinos insists on calling the Super Rugby competition – has deteriorated into a weekly exercise in stale, uninspiring, and oft sleep inducing rugby of such low quality that I find my mind wandering while I am supposed to be watching a game and taking notes so that I can offer an informed opinion of what happened on the field. My thoughts roam to the book I am reading, or my “Square Foot Farming” experiments with tomatoes, spinach, sweet peppers and the like. I start thinking about that piece of fish I am going to pop in the smoker tonight, or the wonderful apples my family are harvesting on their farm. I think of anything but rugby. My thoughts roam far and wide, sometimes I might be startled back to the game on my TV screen, often I am not. Thankfully I do have the facility to record every game and then go back and fast-forward through proceedings, pausing and watching those important bits I missed during my daydreams. Increasingly, those important bits that I may have missed have become less and less, as the game of rugby has deteriorated into a slug-fest of slow, dire crashball rugby stifled to death by rush defence systems and ignored offside lines that do nothing to facilitate a game of movement and initiative. Rugby has become unbelievably boring. Let me add, that it is not just Super Rugby that is boring. I read elsewhere of one of my readers proclaiming that he is “finished with South African Super Rugby teams” and that he would watch some English and French rugby and perhaps some Tests. Sadly, he is seriously deluded if he thinks the situation is better in the north. French rugby is dour, slow stuff, where skills have been neglected for decades and their teams try and buy success by importing international players from outside France. Most frequently those internationals struggle to make an impact in the French game, simply because they are used to the fast pace of southern rugby and do not fit into the chundering mess that is rugby in France. Julian Savea is just one such marquee player that has recently been in the news for not making the impact his employer expected of him. English Rugby is perhaps a little quicker than French rugby at the moment, but it is also built on massive defence, colossal pileups, and very little of the free-flowing open rugby that entertains. Rugby is strangling itself to death on a diet of rush defence, hundreds of rucks, and resetting of scrums, along with never-ending penalties that no one understands. And I, as someone who has a passion for this game, who loves the history, the ethos, the traditions and the excitement of the game, am finding myself increasingly considering finding something else to write about, rather than rugby. Or, dare I say it, modern rugby. The science that rugby has become has resulted in huge effort being expended on analysing every single aspect of the game, and then working out and practicing a counter for every eventuality. This is not so much Analysis-Paralysis, as it is Paralysis by Over-Analysis! Back in mid-2017 the British & Irish Lions, who had carefully analysed the way the All Blacks play their rugby, had worked out that the only way to beat the New Zealanders was to shut down their backline before they had the opportunity to move. The Rush Defence was thought through, practiced, refined, and practiced again, and then unleashed in the Test series against the All Blacks. It stopped the All Blacks, mostly, and resulted in a drawn series – which the British & Irish celebrated as a successful tour. The knock-on effect of that tour is being felt today as every team at every level of the game now deploys the rush defence to stifle any enterprise their opponents might vaguely think of introducing into the game. The result: Dour, boring rugby. Consider that the average number of tries scored in a 2019 Super Rugby game has dropped, for the first time in the history of the competition. In 2019 games are giving us an average of 6,39 tries per game, the lowest in four years and a drop of 12,23% from last year. Last year, while teams were still learning about the rush defence and how to implement such systems, Super Rugby averaged 7.28 tries per game. If dig a little deeper examine trends over the entire history of Super Rugby, we know that more tries are scored in the first half of the season than in the second, when winter sets in and cold, often wet conditions become a factor. Fatigue and injuries step in to deprive teams of their early season edge, and more conservative game plans are deployed as the games tighten up in the quest for a playoff slot. Less tries are scored in the second half of the season. That average of 6,39 may well drop into the 5 mark. The decrease in tries is mirrored by a decrease in two other key attacking categories – clean breaks and defenders beaten. For attacking categories, read entertaining categories……. In 2016 there were a total of 2,889 clean breaks made during the season, at 20.35 per game. That average rose to 21.42 in 2017, with a sharp increase to 23.74 in 2018, as attacks became adept at breaking the line before the rush defence systems were fully functional. This year, though, that figure sits at 18.67 per game – a whopping drop of 21.36 per cent from last season. Figures for defenders beaten has also fallen by 9.87 per cent so far this year. All of which bears out my contention that the game is finding more and more ways of strangling itself to death. And I am struggling to focus on rugby with the enthusiasm and interest that has been part of my life for the last 50 years! Why is it that we are talking about the referees, rather than about the rugby? Is it perhaps because these officious fellows with the whistle, and absolute power on the rugby field, are ruining the game with their weird and inexplicable rulings? Is it because Jaco Peyer dished out three possibly justifiable yellow cards as he managed the game between the Brumbies and the Crusaders, yet still missed one high tackle that should, if he had been vaguely consistent, have seen a third yellow card to the Brumbies? The first, shown to Owen Franks in the 27thminute was probably fully justified, perhaps the citing commissioner might even suggest that his actions were close to worthy of a red card? Toni Pulu’s card in the 53rdminute was a 50/50 call in my book, and had a direct impact on the game as the Brumbies, reduced to 14 men, gave away 2 tries while Pulu was sitting in the naughty chair. However, based on Peyper’s call in the Pulu incident, the Brumbies were very fortunate, some 5 minutes later, when yet another high tackle, almost identical to that of Pulu, was ignored. They should, based on precedent set in this very game, have lost another man to the chair. Even the commentators were puzzled, saying that there has to be some consistency. Pulu’s 10 minutes had scarcely ticked over when Peyer was reaching for the pocket again and sending Sam Carter off for a ten minute spell, in the 65thminute, and ensuring that there would be no way the Brumbies could come back into the game. Two more tries were scored while Carter was off the field. Whilst the letter of the law might suggest that both the yellows for Pulu and Carter were correct, the inconsistency in the incident sandwiched between the two cards is the real issue. Yet Peyper was probably the best of the referees on display over the weekend! Marius van der Westhuizen produced one of the more inept displays of refereeing seen in Super Rugby this year as he managed the game between the Reds and the Stormers. The number of errors the man made is beyond counting, unless you are really bored and want to go to your PVR and sit through a stultifying boring game for a second time. Offsides was a mere rumour, and the laws for forward passes, obstruction, and playing opponents off-the-ball are only considered suggestions by Mr van der Westhuizen, to be applied if and when he feels like it. Although his numerous mistakes did not tend to favour one team over the other, his decision to hand a yellow card to Siya Kolisi for a “cynical professional foul” after not releasing a tackle quickly enough borders on ridiculous, and effectively handed the game to the Reds! Nic Berry should not be allowed to referee Super Rugby, much less a Super Rugby game where an Australian side is involved! Quite how he missed Billy Meakes’ 66thminute assault on Jason Emery boggles the mind. It was late, and it was a no-arms shoulder to the head that Owen Farrell would be proud to call his own. Mr Berry and his fellow Australian TMO Ian Smith ignored the incident, which was somehow also missed by the assistant referees Marius van der Westhuizen (heard of him?) and AJ Jacobs. At least the Citing Commissioner saw it and Meakes will face the judicial committee for this one! At Loftus Versveld there could be no doubt about the two yellow cards earned by the Bulls. But there s a question about Rasta Rasivhenge’s call that a penalty kick played back in-field by the Jaguares after the ball crossed the plane of touch was legitimate or not. If the player’s feet were in contact with the ground, it was not and the lineout should have gone to the Bulls, if the player was aerial at the time and played the ball back before he came to earth, then it was legitimate and “play on” was the correct call. I have not watched the replay of the incident yet, but it was a crucial moment. The Bulls were on top, ahead, and would have been in possession inside the Jaguares half. As play continued the Jaguares counter-attacked straight into the Bulls half, and the next phase of play lead to Tim Agaba’s yellow card. Whilst the Bulls have only themselves to blame for losing to a sub-par Jaguares outfit, the really crucial moments in the entire game came when the referee and his assistants missed two clear forward passes in the run-up to two Jaguares tries. Neither try should have been awarded! The bottom line to this entire discussion, is that in three games referees made decisions that had a direct impact on the outcome of the game, Jaco Peyper’s yellow cards, Marius van der Westhuizen’s error ridden performance, crowned by a very harsh yellow card, and Nic Berry’s performance for the Rebels. Whether Brendon Pickerill and Rsata Rashivenge erred in allowing the game to continue when the ball appeared to be out remains a question that will only be answered when I have time to go and sit and watch my recording of the incident again, but the entire officiating team missed those forward passes. What do Damian McKenzie, Dillyn Leyds, Curwin Bosch, Semisi Masirewa, Bautista Delguy, Rosko Specman, and Cheslin Kolbe all have in common? They are little guys, every one of them. And they are amongst the most exciting rugby players on the planet today. Quickness is their hallmark. There is a marked difference between “quick” and ‘Fast” in this context. These men are amongst the most elusive runners in the business, with a quickness of hands and feet that frequently dazzles opponents as they swirl and twirl their way past tackles and in and out of spaces. In a rugby world where size has become the watchword, where midfielders are 15 to 20kg heavier than their rugby predecessors of 25 years ago, where wings resemble 18-wheeler trucks. In a sport where biceps and trapezius muscles bulge, where the pectorals are larger than paving stones, and where the quads look like something from a body building expo, these little guys are the exceptions. These are the little guys, the clever ones, the runners, the chasers, the steppers and swervers. These are the entertainers! The ones we love to watch. Which suggests that size is not everything. The Hurricanes flanker has been one of the rugby players of the 2019 Super Rugby competition so far, and against the Highlanders he put on a masterclass that must surely have booked his seat on the plane to the RWC in Japan. Savea has been winning turnovers all season long and on Friday he scored two impressive tries that many wings would be proud of. The first saw him take an intercept and then outpace the Highlanders chasers over 70 metres, the second saw him put in two side-steps that evaded covering defenders before he outsprinted yet more defenders to the corner. Watch him, he is on a roll! Sometimes it seems that he is the only Stormers back that understand that the game is about running with the ball with the intention of breaking through or past your opponents’ defences! He carried the ball 43 meters in 5 carries on Saturday, making one tackle break and beating 4 defenders and making a line break. He also made all his tackles, missing none. It was his elusive running with the ball, and his enterprise with the ball in hand that caught the eye. After a somewhat poor 2018, Leyds is rapidly getting back to the kind of form that made him a Springbok. Leyds has carried the ball well in 2019, making an average of 8 meters every time he has run with the ball, which is right up there with the likes of Rieko Ioane and Melani Nanai of the Blues, two of the better carriers in the game! Rassie Erasmus must be taking notes! Ma’a Nonu was particularly impressive this weekend as he put together a stellar performance to help Blues beat the Waratahs. Nonu is almost 37, yet he again tormented and teased an Aussie team as he created space for those around him. He also scored his own try just to put the cherry on a vintage Nonu performance.. He might just get a call from Steve Hansen. After all, you cannot buy that kind of experience! There will still be question marks over his defence, but on attack this youngster was simply sublime. No, he was better than sublime – he simply ripped the Lions to shreds. Quite why he has been playing off the bench for the Sharks is something Robert du Preez (Snr) needs to explain. There have been suggestions that he has started to look for a rugby home away from Durban as his frustration at being a bench-warmer was starting to bubble over. Given an opportunity against the Lions, Curwin Bosch produced a truly memorable performance as he sparked the Sharks attack into real action for the first time this season. Carrying the ball 11 times, he made 104 meters with the ball in hand, including a massive 9 clean breaks. He had a hand in a couple of the Sharks tries as he stood head and shoulders above everyone else on the field. One of the little guys showing his worth! After eight rounds of Super Rugby, Lukhanyo Am is in the form of his life, and is probably the form 13 in South African rugby. Week after week he has produced the goods, often man-alone in a Sharks back division that has stuttered and stumbled most of the time. So far in 2019 he has made 441 meters with the ball in hand, in 52 carries, an average of 8,5 meters per carry, which is as good as the best. He has made 43 good passes, 4 offloads, and missed just 8 tackles in the crucial outside centre channel. Perhaps most impressive is his presence in the tackle and over the ball on the ground, where he has produced a number of dominant tackles, four more on Saturday, which also gave him four very good turnovers. Perhaps the Sharks should move the ball wide more often, because Am’s timing in the pass has been superb as he releases his wings onto the ball and into space. Just on Saturday he scored a try, carried for 83 meter in 15 carries and beat five defenders. In addition, he made six tackles and won those four turnovers. There may be some that doubt, but he would not disgrace a Springbok jersey on current form! Sixty tries in Super Rugby is no easy feat. Israel Folau now stands all alone at the top of the pile with the record number of tries in Super Rugby. His try against the Blues – via a high kick (who would have guessed?) – was his 60th in Super Rugby, and set a new mark for all the chasers to aspire to. The previous record holder was Doug Howlett, who is still the All Blacks’ top try scorer. Folau is not everyone’s ideal fullback – his defensive nous is average at best and he tends to disappear from a game when his team is on the back foot, but as an attacking player he has few peers. When chasing the kick he is almost imperious, with his height and the power in his legs he gets higher than any defender can hope to jump, which gives him an almost unnatural advantage. The question is being asked: Where is Kurtley Beale? The man with the sublime talents and the wonderful running ability is woefully off form in 2019. Some might suggest that he has been woefully short of form since 2016 and wonder why he is still in the Wallaby frame. Certainly, the Kurtley Beale that had the ability to penetrate any midfield in the world is missing in action at the moment. As his attacking abilities have gone missing, his defences have simply evaporated to the point where his coach, Daryl Gibson, benched him against the Blues for fear that he would resemble a turnstile against Ma’a Nonu and TJ Faiane. When he did come on against the Blues his attacking performance was abysmal. In the 55th minute the ‘Tahs were deep inside the Blues 22. Beale had the ball and could do one of two things. He could move the ball out wide and stretch the Blues defenders, or he could straighten the attack, take on the defence and force the Blues to commit defenders, creating opportunities out wide for a quickly recycled ball. He did what he has been doing for the last two years. He ran sideways, going nowhere. Right now, Michael Cheika must know that Beale’s days as a Wallaby are over. Why do I suggest that they are in a bit of a bother? They won this weekend, they are equal-second on the overall log with 23 points, just behind the Crusaders. 8 played, 5 win, 1 draw – surely things are going swimmingly? Yet, they just do not seem to be the Hurricanes we know they can be. Yes, the modern trend for suffocating rush defence is limiting their opportunities to play their wide open, sweeping running game, but even then things are not quite up to scratch for the ‘Canes. In the past four weeks they have managed two wins but neither was overly convincing, including their win against the Highlanders this past weekend. In the other two games in the four week stretch they lost to the Crusaders and drew with the Chiefs – a team who have only won twice from their seven matches. I guess that the fact that the ‘Canes are second in the competition while playing poorly is a message to everyone else. Watch out for the day they click into gear! What’s up with the Highlanders? Seven games, and just two wins? That is not what one expects from the Highlanders, They do have 14 log points, thanks mainly to the cancelled match against the Crusaders that handed them 2 points for the “draw” – if it were not for that “draw” they would be on the bottom of the New Zealand log and looking even worse than the Chiefs. The Highlanders are in a slump such as we have not seen from the men from Dunedin before, and it is likely to continue this weekend when they have to play the Crusaders in Christchurch. The Whole South African Conference. The South African teams are playing so inconsistently that trying to predict a result when any SA team is involved is like trying to choose a winner between two blind boxers. There may be a winner, but who? This weekend saw two SA sides held to zero points in the first halves of their games. Not a single point in 80 minutes of rugby, and one of those teams is the Lions, one of the high scoring teams in Super Rugby and Super Rugby finalists in the last three years! The inconsistency is best illustrated by looking at the results of the Sharks. This week they shredded the Lions into a finely chopped meat salad, yet they in turn have been shredded by the Bulls and stuttered and stumbled in so many of their games…. When a South African side hits its stride they can be hugely entertaining, yet they are just as likely to pitch up for a game and then go AWOL on the field. The sad reality is that you have no idea what you’re going to get from one week to the next. Many in the media are pointing fingers at the departure of so many talented players heading offshore to ply their trade elsewhere, and this may well be a contributing factor. However, I believe that South African rugby is suffering from a different disease that is entirely self-made. Call it nepotism, or jingoism, or any other ‘ism you can think of, but the persistence of contracting poorly qualified and inexperienced local coaches lies at the root of the problem. Not one of Robbie Fleck, Robert du Preez, Swys de Bruin, or Pote Human is likely to be offered a job coaching a Super Rugby team elsewhere in the southern hemisphere. Oh, Japan might offer them a job, or they might be called over to one of the junior clubs in the UK, but nobody in Super Rugby will be calling……. The problem is not solely with the coaches themselves, it lies with the administrators and the rugby-political infighting that accompanies every attempt to recruit a new coach for any of the teams. The mess that followed Eddie Jones’ sudden departure from the Stormers; the firing of John Plumtree and the sudden arrival and then departure of Jake White and then Gary Gold; the mess that followed the departure of John Mitchell from Pretoria; Mitchell’s hiring and firing in Johannesburg; the weirdness of coach selection processes, even at the national level, tells of an administrative nightmare. The constant meddling and muddled thinking, together with their penchant for interference in professional rugby related matters suggests that it is the amateur administrators, the blazer wearers and the suits, that sit at the very root of the problems in South African rugby. Yet another close run thing for the Hurricanes, who are simply not firing on all cylinders no matter which way you look at their game. The ‘Canes forwards managed to find an extra gear at a couple of critical moments which enabled the win. I guess we will have to say this is a game the Highlanders lost rather than one that the Hurricanes won. The Highlanders are struggling with form, and have not found a game plan that works for them since the departure of Lima Sopoaga. Ardie Savea was the one bright spark on the field, providing something to talk about in an otherwise instantly forgettable game of rugby. 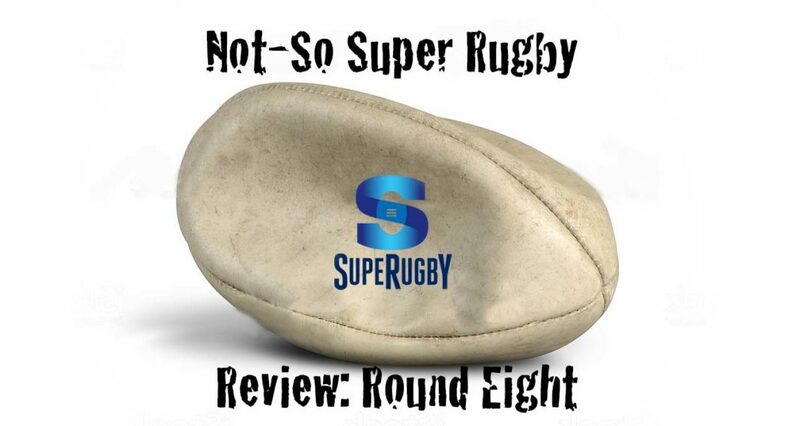 A rubbish game of rugby that is everything that is wrong with Super Rugby in 2019. A referee who missed more than he saw, two uninspiring teams flogging the game to bits in an almost empty stadium. The Stormers had plenty of opportunities to put this game out of reach but failed to take any of the chances that came their way. The Reds took their chances, hence they won the match. That is about all one can say about one of the worst rugby matches it has been my misfortune to watch. The handling on both sides was as poor as that of an U14 D team comprising the school’s hockey players who have been forced to play a game of rugby. Tactical accuracy and decision-making was a mystery to all. A harsh yellow card shown to Siya Kolisi was the difference between the two teams as the Reds managed two scores while they had the numerical advantage. How did SP Marais miss that kick? Maybe he needs a rest from the game? This was a game of rugby that left me with a sour taste that lasted all weekend. The only tiny bit of relief was Dillyn Leyds with the ball in hand. He did seem to understand the need to try and do something with the ball. The Lions inherent problems were starkly revealed by the Sharks this weekend. A pack of young forwards that is missing some of the real heavyweights and power players of the past; a captain who is hugely inexperienced in the role and does not seem to have the nous and ability to pull his payers together when the going gets tough; and a bunch of so-called senior players who simply vanish when the pressure mounts. These issues have been the subject of comment all season, and, if the truth be told, were not wholly unexpected in 2019. The Lions of 2019 are not the Lions of 2016, 2017, and 2018. The Sharks, without the shadow of a doubt, are the same Sharks of the past 5 years. Simply, their inconsistency of the previous years, and previously this season, was spotlighted by this single performance. Suddenly, after some seriously stuttering games, they found their game! On paper, they have one of the better squads in the country, on the field they are pure South African – Inconsistency personified. The stats will tell you that they dominated every single aspect of this game. They carried the ball more, further, and to greater effect than the Lions. They made more clean breaks, they beat more defenders, they monstered the ball on the ground and won 10 turnovers. This was a display of dominance we have not seen from the Sharks previously in 2019. Most pleasing was their willingness to take the ball into the wider channels, allowing players of the likes of Lukhanyo Am and Curwin Bosch the freedom to have some fun with the ball in hand. Even Andre Esterhuizen seemed to find it easier to pass that ball than he is used to doing. (His hands did let him down a couple of times, once with the tryline looming.) Just for once he showed glimmer of being something more than the crash-ball one-trick pony that he has become. The Lions were thoroughly outplayed at home, and this must be a real worry for their supporters. Sadly, despite the Sharks’ dominance and their six tries to one, there were still too many mistakes, too many poor decisions, and too many players trying to smash their way over opponents rather than letting the ball do the work. If the Sharks had played with more finesse and less brutality, the score could have been astronomical! There is not really much that one can say about this game. The whole affair stuttered along through an uninspiring first half that was more error than effect. The Crusaders seemed so lackadaisical and disinterested that the Brumbies might just have started to think they had a chance of an upset. Many TV watchers would have changed channels at halftime and gone off to watch yet another rerun of Top Gear on the other channel. The second half saw the Crusaders back to playing the kind of rugby we know they can. The kind of rugby we expect from them. Aided and abetted by some really silly disciplinary issues and yellow cards aplenty, the Crusaders proceeded to dismantle the Brumbies. End of story. And that is about all one can say about it. So Israel Folau scored his 60thSuper Rugby try. And the Waratahs, needing three points for a draw and a try to win the game, decide to go for a box kick in the final minutes of the game, when pressing in the Blues 22m area? Weird decision, weird tactics, and typically 2019 Waratahs. The Blues were forced to work hard for this one, with Ma’a Nonu producing a vintage performance to rule the midfield, while Patrick Tuipolotu was perhaps the best of the forwards on the day. Four wins on the trot for the Blues. If my records are correct the last time they managed this kind of winning streak was back in 2011. They are looking better with each win. And the Waratahs? Well, pretty much as expected. I will not bother you with a match report, there was nothing worthwhile to report on. I commented on Billy Meakes’ unpunished assault on Jason Emery earlier in this review. We await the outcome of the disciplinary hearing. The Rebels beat the Sunwolves, and that is exactly what we expected would happen. Reports are saying that coach Pote Human has blasted his Bulls players for their sheer stupidity in failing to close out the win and handing this game to the Jaguares. He is putting it mildly. This was not stupidity, it was suicidal incompetence! Two yellow cards and playing rugby with 13 men is a recipe for disaster, and it was a recipe that the Bulls cooked to perfection! They allowed the Jaguares to score two tries in the final 10 minutes and to come back, somehow, from being 20 – 10 down, to win the game by 22 to 20. The first act of sheer stupidity was from Tim Agaba, who charged into a ruck with his shoulder in the 71st minute. Off he went and the Bulls were down to 14. The Jaguares scored the first of their come-back tries within 5 minutes of his departure. Yes, there was a forward pass in the run-up to the try, but that does not excuse Agaba’s silliness. Then it was the suicidal incompetence of prop Conraad van Vuuren, who chased the kick and charged mindlessly into the legs of the player in the air. He immediately saw another yellow card, the second of the final ten minutes of the game. The Jaguares took full advantage of their numerical superiority as the Bulls stumbled and fumbled in the final three minutes, and the visitors scored the try that would win them the game. Once again there was a forward pass in the lead-up to the try, but aside from that, the Bulls only have themselves to blame. The stats show us that the Bulls had been in charge of the game all the way through, until those mindless, and needless, yellow cards lost them the game. I must add that the Bulls had plenty of opportunities to put this game beyond the reach of the Jaguares, but lacked the patience and composure needed to make the opportunities count. There are lessons to be learned in every game, and the lessons for the Bulls in this one are perhaps more important than most. Discipline is an integral part of rugby, and if you step over the line of what is acceptable, you can cost your team a game. Tim Agaba and Conraad van Vuuren did exactly that. Previous articleThank You, Israel Dagg! Next articleIt Is Not All Wine & Roses In The Premiership!